Makita has come out with a new 18V cordless, brushless drywall screwdriver (XSF03M) that is powered by their new 18V 4.0Ah batteries, which they say has the power and performance of a corded drywall screwdriver. The benefit, of course, is that there is no cord to get in the way. 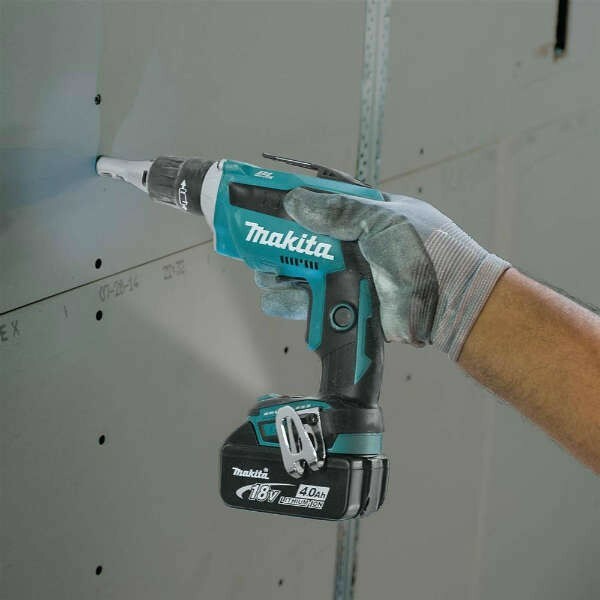 Brushless technology along with larger 4.0Ah batteries should already give the Makita drywall screwdriver a long runtime, but Makita added a new feature called Push Drive that should extend it even further. From my understanding, users can lock the trigger in the ON position, but the tool will not start running until the fastener is engaged. The Push Drive feature can also be turned off so the tool can be used just like a regular drywall screwdriver; but I can’t see why you would want to. 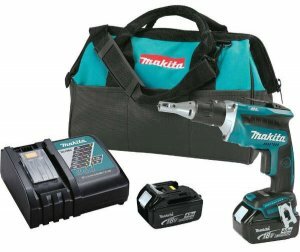 In internal testing, Makita says the XSF03M drywall screwdriver was able to drive 1,800 screws into ½” drywall through 20-gauge steel studs on a single charge of the 4.0Ah battery at an average of 6 seconds per screw. Using these numbers they say a person could hang about 40 sheets of drywall during the average work day. Other features include an LED fuel indicator, a built-in LED light to illuminate the work area, and all metal gears and gear housing. The tool itself only weighs in at 3.8 pounds, which is about what a standard corded drywall screwdriver would weigh.